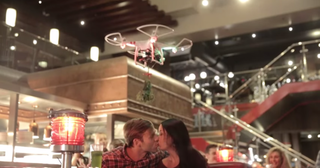 When TGI Friday's announced a promotion involving mistletoe-toting drones flying around inside its restaurants, the idea seemed both dumb and unoriginal. Now, that the restaurant's gimmicky marketing campaign has shed blood in Brooklyn, it just seems dangerous. And TGI Friday's isn't even taking the blame! TGI Friday's never officially acknowledged the injury. The spokeswoman even "dismissed concerns about further injuries," the Brooklyn Daily reports.